I had this idea that I was going to rope a deer, put it in stall, feed it up on corn for a few weeks, then kill it and eat it. The first step in this adventure was getting a deer. I figured that, since they congregate at my cattle feeder and do not seem to have much fear of me (a bold one will sometimes come right up and sniff at the bags of feed while I am in the back of the truck not 4 feet away), it should not be difficult to rope one. Just get up to it and toss a bag over its head (to calm it down) then hog tie it and transport it home. 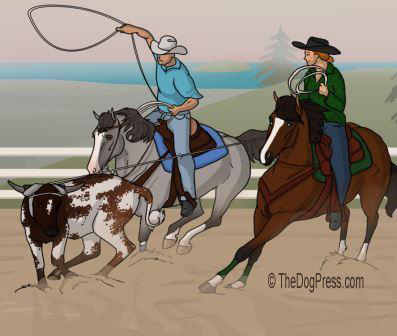 The first thing that I learned is that, while a deer may just stand there looking at you funny-like while you rope it, they are spurred to action when you start pulling on that rope. The second thing I learned is that pound for pound, a deer is a LOT stronger than a calf or a colt. A colt in that weight range I could fight down with a rope and with some dignity. A deer—no chance. A brief 10 minutes later, it was tired and not nearly as quick to jerk me off my feet and drag me when I managed to get up. It took me a few minutes to realize this, since I was mostly blinded by the blood flowing out of the big gash in my head. At that point, I had lost my taste for corn-fed venison. I just wanted to get that devil creature off the end of my rope. I figured if I just let it go with the rope hanging around its neck, it would likely die slow and painfully somewhere. At the time, there was no love at all between me and that deer. I hated the thing, and I would venture a guess that the feeling was mutual. Despite the gash in my head and the several large knots where I had cleverly arrested the deer’s momentum by bracing my head against various large rocks as it dragged me across the ground, I could still think clearly enough to recognize that there was a small chance that I shared some tiny amount of responsibility for the situation we were in, so I didn’t want the deer to have to suffer a slow death, so I managed to get it lined back up in between my truck and the feeder - a little trap I had set before hand...kind of like a squeeze chute. Now, when a deer bites you, it is not like being bit by a horse where they just bite you and then let go. A deer bites you and shakes its head—almost like a pit bull. They bite HARD and it hurts. The proper thing to do when a deer bites you is probably to freeze and draw back slowly. I tried screaming and shaking instead. It seems like the deer was biting and shaking for several minutes, but it was likely only several seconds. I, being smarter than a deer (though you may be questioning that claim by now) tricked it. While I kept it busy tearing the bejesus out of my right arm, I reached up with my left hand and pulled that rope loose. I learned a long time ago that, when an animal—like a horse—strikes at you with their hooves and you can’t get away easily, the best thing to do is try to make a loud noise and make an aggressive move towards the animal. This will usually cause them to back down a bit so you can escape. The reason I had always been told NOT to try to turn and run from a horse that paws at you is that there is a good chance that it will hit you in the back of the head. Deer may not be so different from horses after all, beside being twice as strong and 3 times as evil, because the second I turned to run, it hit me right in the back of the head and knocked me down. 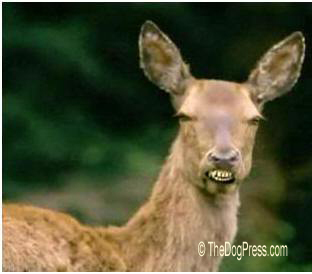 Now, when a deer paws at you and knocks you down, it does not immediately leave. I suspect it does not recognize that the danger has passed. From Texan Dave Dorsett who says he has bagged a deer or two but swears he never tried to rope one. Submit your Funny Effect, if used, you win a $50.00 certificate good on any NetPlaces Network site and be in the $200.00 CASH runoff in November. Just in time for Christmas!